Saint Patrick’s day is upon us again and I wanted to get in a quick post to honor it, and also to reflect on the feasting Shawn and I did last year. 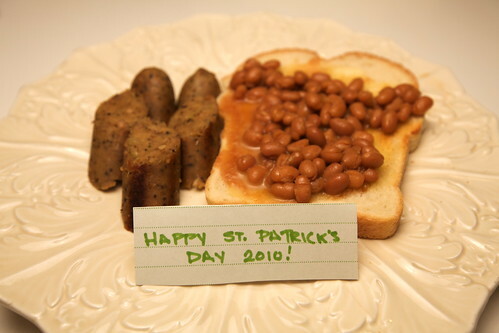 This year we won’t be feasting for every meal, but we’ll try to squeeze in a few Irish themed dishes. We started early by having some beans and toast tonight, with some apple sage field roast sausage. I’ll try out some new recipes for tomorrow, but why mess with something that is amazingly delicious as it is? Now, back in February, I mentioned I had a few knitting projects going and that I might just share one for Saint Patrick’s if I finished in time. Guess what…I did! Even with making a million mistakes and having to undo hours of work, I managed to complete the above pictured fingerless gloves. 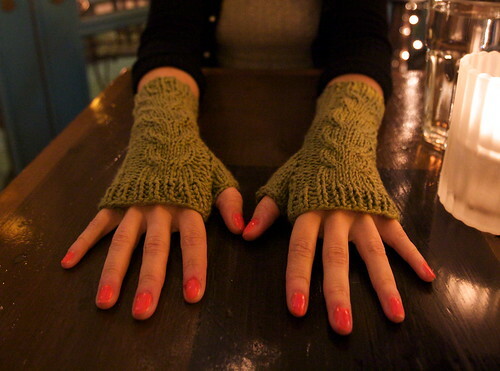 They’re made with organic cotton yarn (in green of course!) that I love. It’s so easy to work with and softer than any not-so animal friendly wool. If you were so inclined, you could knit these yourself as there is a free pattern available, which I’m always appreciative of. These guys are so comfy and also great for keeping warm on a bike ride without losing your grip. Part of the reason there won’t be extensive feasting this year, is because I’ve been rather busy baking away. 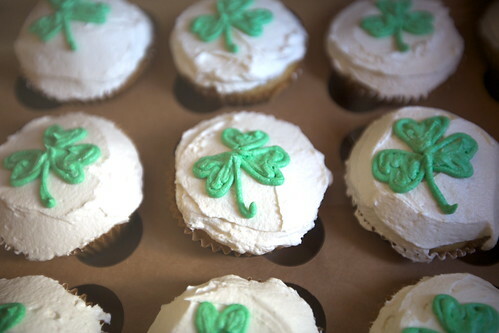 I did manage to get some special St. Patrick’s day cupcakes over to Meet Market, so if you need some Saint Patrick’s day treats you can get your own lucky shamrock vanilla cupcake, or some Peppermint Patty cupcakes or even a special green themed “hostess” cupcake with marshmallow cream filling. Get them before they’re gone though, they’ve been selling out awfully quick. the hostess cupcake with marshmallow creme filling sounds divine! Happy St. Patrick’s Day! I LOVE your fingerless gloves! OMG I love those gloves! Got my cup cozie today, thank you! I forgot to tell you that I got one of the Hostess cupcakes from the meet market and it was so yummy! I could have eaten a whole batch of them. Those gloves are too darn cute. I can only knit scarves, but maybe I will venture into new territory with that free pattern. Those fingerless mitts are gorgeous. Thanks for sharing the free pattern, it may just get me motivated to start learning knitting again.